This was my fourth year in a row at Gamescom (see my impressions from 2015, 2014, and 2013 by clicking on the link on the respective year). Since I’ve documented my experience via twitter this time, I shall imbed those tweets and add additional commentary. I walked past the crowded entrance and used the eastern gate to get in shortly past 9. Unfortunately I walked around too much, instead of getting in line immediately. Hence, I did spend two hours in line at the Playstation VR section. The demo itself was pretty cool – you drove a tank with the left stick and aimed with the right, all the while being able to look in every direction. The displays inside of your cockpit almost had a 3D look to them. I was very impressed and will most likely buy a VR headset for my PS4. CD Project Red only showed the Gwent multiplayer, which was very similar to the mini game from Witcher 3. I won with the Northern Realms against Beasts and then later on I lost with the Northern Realms against another Northern Realms player. Unfortunately there were no news, apart from “we’re still working on it,” regarding their cyberpunk game. Hidden away in hall 10.1 is the Indie Arena Booth, which is always my highlight of the Gamescom. This year it was even bigger and the additional space made it feel less cramped than last year. I intended that to be a compliment, but worded it so poorly that the organizer probably took it as an insult – oops. Nevertheless, it was really really good and a lot of the indie games look very professional and polished. Here is a small selection. I did attend the Role Play Convention earlier this year and was surprised to find a booth of their own at Gamescom. They provided phone chargers and some sitting space there. 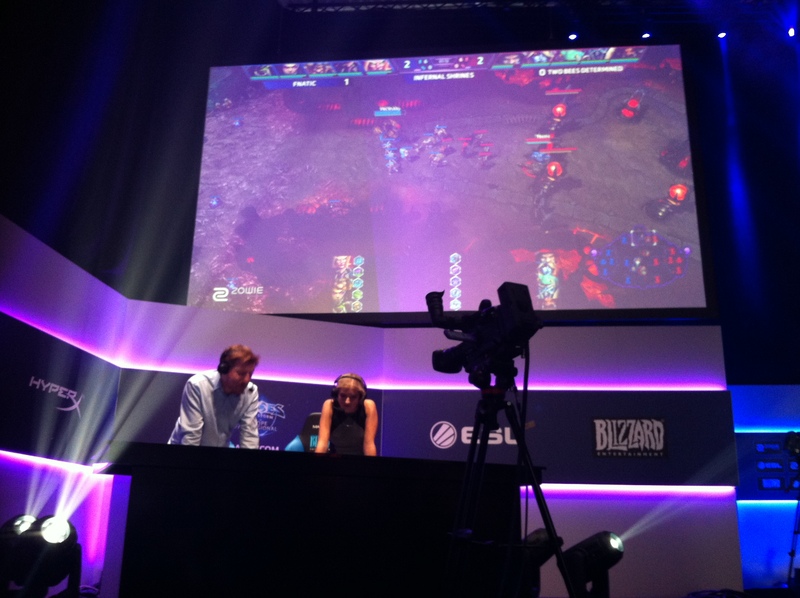 Afterwards I checked out the Heroes of the Storm tournament. Since I do not play that game, I cannot appreciate the intricacies of what is going on. That said, it was easy to understand things – blue vs red and whoever gets a level lead and kills more enemy heroes seemed to win. 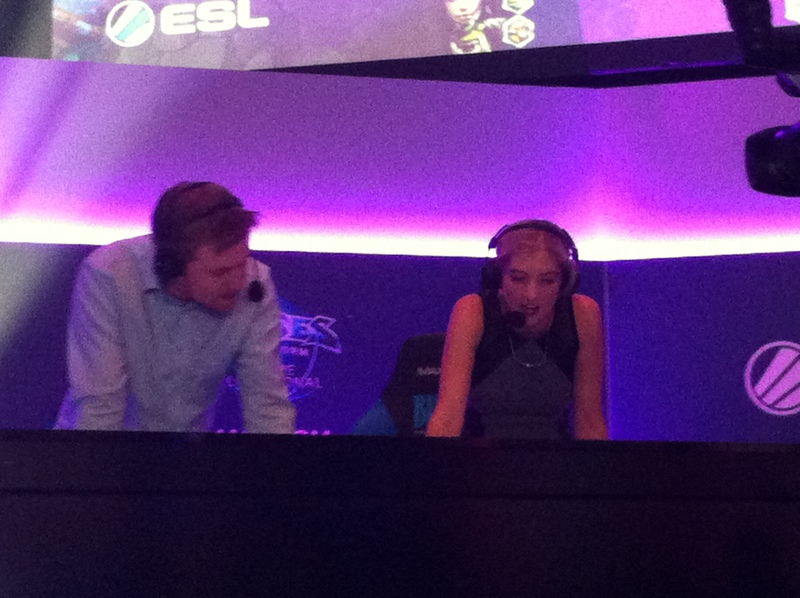 The game I watched was casted by James “Kaelaris” Carrol and Jaycie “Gillyweed” Gluck, who I met at MLG Anaheim 2014 when I wrote articles for Misscliks. Sadly she had to run off to the commentary desk immediately after casting, so there was little time to catch up. After this mini break, I went on to look for the Destiny expansion and Civilisation 6. On my way I came across Titanfall 2 and checked that out, since there was no line. At first it was the standard multiplayer fare, but with the extra ingredient of a mech. At the end something very cool happened that I have never seen before in another game: my team won and after the winning screen it said “epilogue mission, hunt down the enemy team before they can evacuate.” I did get two of them, but the others flew away in a shuttle. That was a pretty nice twist, especially since the map itself was about capturing and holding control points and not about fragging. Destiny on the other hand was just like the Destiny demo 2 years ago, but with a new map. This time people were a lot better and I could not do anything. I did not like the demo at all, but will probably buy the expansion regardless, since that multiplayer demo does not mean anything. On my way to Civilisation 6 I came across the Startrek Bridge Crew demo, but they had already closed their lines. Civilisation 6 also closed their lines, after I got in, but instead of letting the last people inside play a bit longer they still kicked me out after a bit less than half an hour. I thought that was weird, since there was no need to make room for other people, but then again it was sufficient to give me an impression. I have not played a civilisation game for more than a few minutes since civilisation 1 and so I cannot say whether it has changed a lot from civilisation 5. However, it does look great and I will certainly jump back into the franchise with this latest game. All in all a decent Gamescom – I got to try out everything I wanted, but there were no big surprises. Next year I will also just attend the industry day, as the regular days are too crowded and there is no point in going multiple days.